Our tapped density testers come in a variety of specifications, designed to give you what you need. Take a look at the model below and select your desired configuration from the available tapped density testers, then ask us for a quotation. All of our tapped density testers are handmade, of very high quality and a far better investment than budget options available elsewhere. 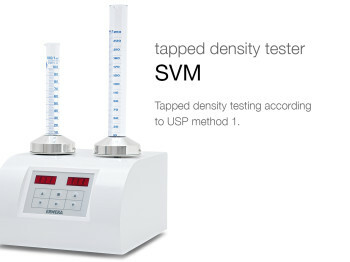 The ERWEKA tapped density tester – SVM series is available for holding one or two glass cylinders and works according USP method 1 or USP method 2.